Doris Marie Lightfoot went home to be with The Lord on January 19, 2016 at The Friendship Village in Tempe, Arizona. Doris was born Doris Marie Applegate on September 15, 1926 in Farmington, Missouri. Her parents were the former William Sidney and Emma Josephine (Allgier) Applegate. Doris grew up on the family farm in Risco, Missouri. She went to school and graduated from Risco High School in 1942. One of Doris’ fondest memories was dancing at the USO with soldiers who came through Malden, Missouri Army Airbase for training. Upon graduation from high school, she passed a civil service exam and went to Washington, DC to work as a stenographer at The Pentagon during World War II. When the War was over, she returned to Southeast Missouri and attended Southeast Missouri State University where she met the love of her life, the former Edward Sebastian Lightfoot who passed away February 5, 2002. They were married on August 23, 1947. Ed and Doris made their home in Jefferson City, Missouri for 44 years where Doris was a homemaker and volunteered at many community activities. They were also long-time members of The First Presbyterian Church in Jefferson City. They retired to Albuquerque, New Mexico in 2000. 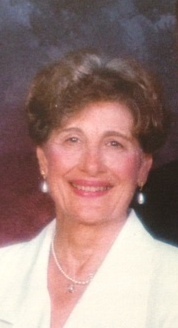 Doris then moved to Tempe, Arizona to be near her son in 2014 and lived happily at The Friendship Village retirement complex where she enjoyed bridge, serving at numerous functions, as well as making many close friendships during the short time she lived there. Doris is survived by 4 children; Cydney Lee Hafner (Steve), Alan Edward Lightfoot (Sharon), Susan Marie Springer (Mark), and Lynn Lightfoot Platter (Scott); 10 grandchildren; Eric Hafner (Jenn), Lesley Maturo (Anthony), Sara Villareal (Armando), Jessica Byrne, Ben Lightfoot, Alison Finch (Michael), Lindsey Springer, Jason Springer, Alan Platter, and Alek Platter; 9 great grandchildren; Rylee and Samantha Hafner, Joe and Jacqueline Maturo, Gia and Seth Villareal, Kaison Byrne, and Channing and Cameron Finch. Graveside services will be held on January 27, 2016 at 2 PM at Sunset Memorial Park in Albuquerque, New Mexico with French’s Funeral Home handling the arrangements. In lieu of flowers, memorial contributions may be made in memory of Doris Lightfoot to www.USO.org or Sandia Presbyterian Church, 10704 Paseo Del Norte Blvd NE, Albuquerque, New Mexico 87122, where Doris and Ed were members.